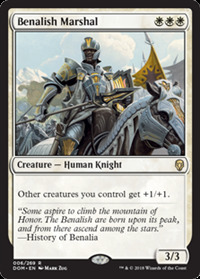 If that Mono-White Knight deck finally appears, this seems like a card to expect. This could be cool in a white devotion shell. Dawn Elemental still wins the "Pretty fly for a white card" contest on its quadruple white cost, but this guy's pretty close and pretty solid by himself. Difficult to pull off in limited though, unless you managed to draft mono-white which would certainly be impressive.